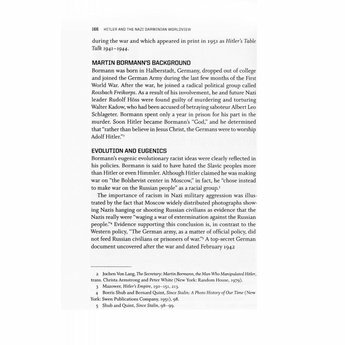 This book takes a look at Germany's most influential Nazi leaders, examining their backgrounds, education, and convictions. 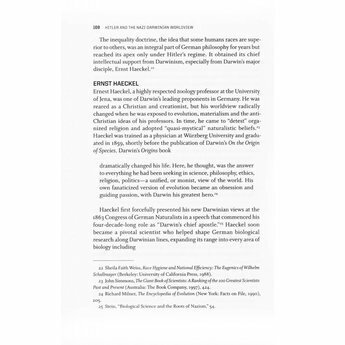 It provides compelling evidence that the rising influence of Darwinism, eugenics and race theory in early twentieth-century society set the foundation for the Nazi pursuit of engineering a German "master race" - and exterminating European Jews, Gypsies, Blacks, most Slavs and the Christian religion in the ensuing madness of the Holocaust of World War II. 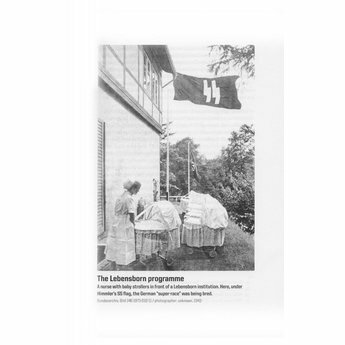 The effect of social Darwinism, eugenics and anti-Semitism, and their relative acceptance in the scientific and medical communities of Germany and many other countries worldwide, opened the door to mass murder, medical experimentation and military conquest. 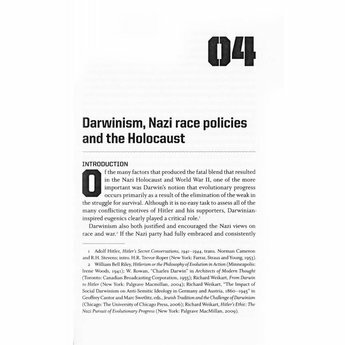 This title examines the roots of Nazi ideology and unmasks the Darwinian "survival of the fittest" theory behind it. 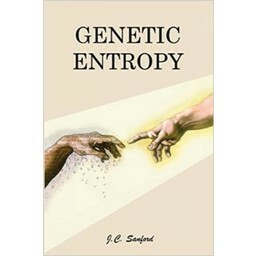 Jerry Bergman (Ph.D.) has taught biology, genetics, chemistry, biochemistry, anthropology, geology and microbiology at the college/university level for over forty years. Dr. Bergman has taught at the University of Toledo Medical School and Bowling Green State University in Ohio. He was selected by his students for Who's Who Among America's Teachers in 2000 and 2005. Dr. Bergman has over 900 science publications to his credit, in twelve languages, has published thirty books and monographs and has been a consultant for over twenty science textbooks. He has spoken frequently about his research on American radio and television programs and at conferences throughout the world. 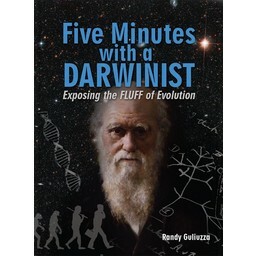 "Professor Jerry Bergman's book is certainly much needed, and I am in total agreement with his overall theme. I found the book interesting and engrossing, especially the second part. I heartily recommend it." Emerson Thomas McMullen, Ph.D., Associate Professor, Department of History, Georgia Southern University, Statesboro, Georgia. 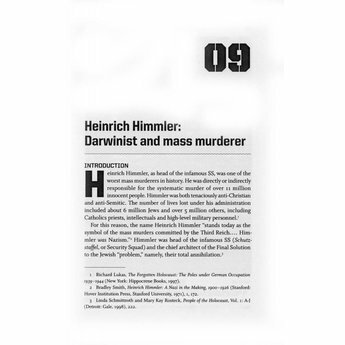 "Hitler and the Nazi Darwinian Worldview is a powerful reminder of the central role Darwin's ideas played in opening the way for the depraved minds of Hitler and his henchmen to conceive and carry out some of the most shocking crimes in world history. 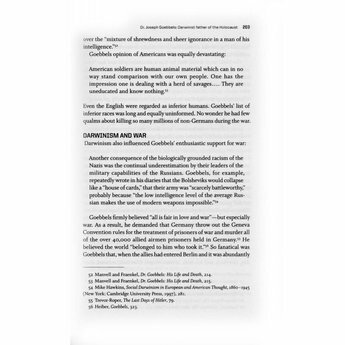 Well documented in the writings of the participants themselves as well as in the accounts of both American and German historians, this book is a sobering study of the evil fruits of a false belief." Steven E. Woodworth, Ph.D., Associate Professor of History, Texas Christian University, Fort Worth, Texas. 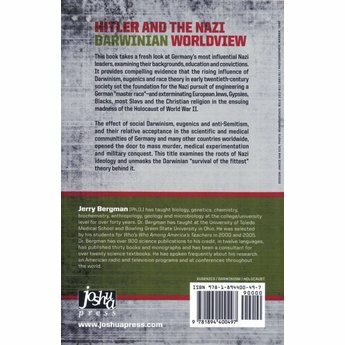 Dr. Bergman reveals how strongly influenced Hitler was by Darwin’s evolutionary teaching of “survival of the fittest” instigating Hitler to employ eugenics, a global belief that only humans who are physically, mentally and ideologically fit have the right to survive. Furthermore, to my dismay, this is a worldwide view we read and witness every day, that of, racial discrimination, bigotry, class distinctions, religious intolerance, and caste systems even though the Holocaust and World War II are in the past.